The 2015 North American Car of the Year will not be known until January 12, 2015, when all 60 votes from jurors around the country are tallied. A strong field of candidates has left many of the 60 jurors who vote for the award wringing their hands, but we are clear thinkers here at New Car Test Drive and I am casting my vote for the 2015 Volkswagen Golf. The entire lineup of 2015 Volkswagen Golf and GTI models is outstanding and deserves recognition. These cars are smooth and refined, easy and fun to drive, with sharp handling. The cabins are elegant, unadorned and classy. The front seats are comfortable and getting in and out is easy. These are practical cars with useful cubby storage and plenty of cargo space. A range of models is available to suit different tastes and budgets. The four-door versions make excellent daily commuters, while the two-door models add sports appeal. The Golf is relatively affordable, with several models starting below $20,000. The 1.8-liter turbocharged engine that comes on the entry models does a good job. (This includes the Launch Edition, Golf S, Golf SE, Golf SEL.) 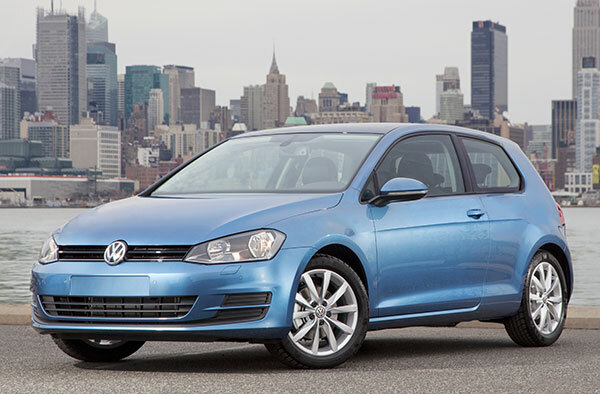 The turbocharged diesel in the Golf TDI gets an EPA-estimated 31/45 mpg City/Highway and offers plenty of power. The GTI scoots around, propelled by its able and willing 2.0-liter turbocharged engine with 210 horsepower and an exhilarating 258 foot-pounds of torque. We won’t know the North American Car of the Year until it’s revealed in Detroit January 12, but the 2015 Volkswagen Golf lineup gets this editor’s vote.